Submit your projects for the Grand Prix Fotofestiwal 2012 competition. This time, the format of the annual contest and exhibition will be different. An international jury of curators will choose the winner and 9 finalists. The jury members are world-class specialists, among others Xavier Canonne – director of Belgian Charleroi Museum of Photography, Simon Bainbridge – editor of “British Journal of Photography”, and Adam Mazur – curator of the Centre for Contemporary Art “Ujazdowski Castle”. We encourage you to read the biographies of the Jury. 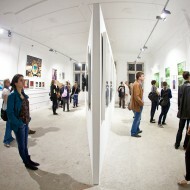 The winner will get a prize of PLN 10 000 (≈2.500€) and the Grand Prix Fotofestiwal 2012 title. The winning project will be presented during an individual exhibition at Fotofestiwal in May 2012. The works of the 9 finalists will be displayed in the form of a slide show during the main festival weekend (10-13 May 2012). It is then that the official results will be announced and the winner’s name will be revealed. Our invitation, addressed to photographers and curators, brings hundreds of applications every year. The competition is open and there are no thematic, age-related or geographic limitations, thanks to which we can present diversified works and personalities. Detailed rules of participation can be found in the terms and conditions of the competition and in the invitation.